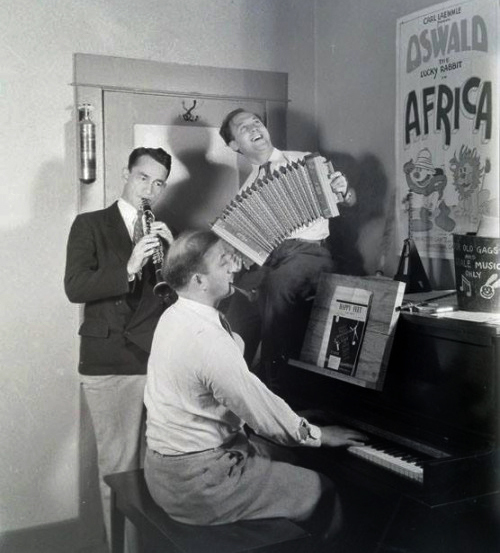 Pinto Colvig (clarinet), Walter Lantz (accordion) and James Dietrich (piano) at the Universal Cartoon Dept. in 1930. Because of his considerable contributions to the Disney studio, it is often overlooked that Pinto Colvig had a role during a formative time with Oswald the Lucky Rabbit at Universal just after Walter Lantz became the series producer. 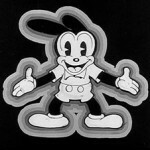 With Disney having introduced an artful synchronization of sound and picture for Mickey Mouse, which required competitors to catch up in a hurry, Lantz was lucky to have an animator who was such a unique mix of creativity, technical proficiency, musicality, and comical pluck. 1930 was a zany and nearly improvisational year for the Oswald series. Lantz and musical director James Dietrich were figuring out how to ply the cartoons with better audio gags, collectively taking baby steps into the sound era. Meanwhile the animators were spitballing all sorts of outrageous visual gags, whether coherent or not. It was a patchwork process that became a recipe for some oddball cartoons. Watching these Oswald shorts today, one is struck by how bizarre they can seem, confirmed by some comments posted by viewers who stumble upon them on YouTube. In a way, these films provide a chronological record of how the staff at Universal hurried-to-learn to make sound cartoons. As artifacts, they remain sort of like watching experiments. Today the boozy, freewheeling ethos of these transitional Oswalds from 1929 and 1930 can serve as an entertainment in itself—so carefree and incipient that they elude any reason to judge them as either good or bad. They simply are what they are, inhabiting a sense of innocent wonder at their own novelty. One of the artists making these cartoons more inventive and maverick was Colvig. 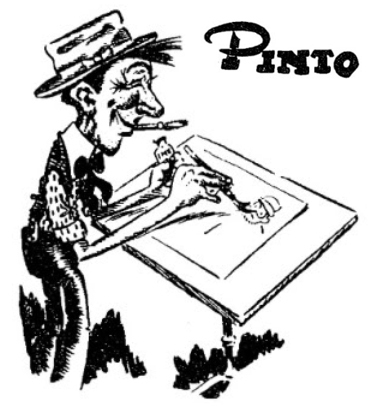 He was born Vance DeBar Colvig, but went by Pinto on account of a nickname related to childhood freckles. Likely he kept it for its suitability as a cartoonist’s name. He was a bit older than Lantz and already had a few careers under his belt: a Pantages vaudeville performer, a newspaper cartoonist, and even ran his own small animation studio in San Francisco. He was working in Hollywood for a few years when he joined Universal, but with his longtime passion for music—he played clarinet and other instruments—his role there took on a different shape. The more that Pinto sang and played, the more he proved his worth well beyond drawing with a pencil. After all, he was a multi-talented comic personality, not just an animator. He became involved with the recording sessions and collaborated with Dietrich. Manuel Moreno remembered that a lot of times Colvig would record the sound effects by himself. Colvig was the voice of Oswald during this period, and he sang lyrics and may have had a role in helping choose songs he performed. Later, in 1933, he was a singer and lyricist on the hit Disney song, “Who’s Afraid of the Big, Bad Wolf?” He also became the voice of Goofy and was a legendary soundman for cartoons, creatively involved in all aspects of the animated soundscapes. He did voices, played instruments, sang with comic range, and no detail was too small for his attention. Lucky Rabbit, that lucky Oswald Rabbit/ Nicest rabbit that you ever knew/ Lucky habit, that lucky Oswald habit/ If you want it here’s what you must do/ Readin’, writin’, ‘rithmetic may often make you awful sick/ But if you learn your lessons quick, just wait til you’ll be through/ Don’t be scrappy but smile and do things snappy/ Make folks happy and you’ll be lucky too. The song continues in a duet with his girlfriend as Cleopatra, where she professes by the end, “I’ve got that Oswald habit.” In the two cartoons that followed, Alaska and Mars, Colvig reprised the theme song in shorter versions with altered lyrics. You can watch Alaska here in this version that has the original titles and credits replaced. The theme song opens the cartoon. You will hear Colvig performing throughout as both Oswald and the villain Putrid Pete. The central musical number is a medley of tunes, including novelty songs like “Second Story Window” with some Colvig embellishments. A shoofly during “Shoofly, Don’t Bother Me” is vocalized as a high-pitched squeak. The “Pop Goes the Weasel” sequence is built from peculiar synchronizations, like a pig using its tail as a corkscrew (is that a fiddle bow?) and a beer-chugging piano. This is a cartoon that suffers beneath an onslaught of piled-up gags and unfocused momentum. It careens all over the place and finally Oswald brings it to an end when he tears off Pete’s pegleg. However, for those who make it to the finale, there is a fan’s reward. The voice that Colvig uses for Pete is very close to how he later performed Goofy. Just listen to him say “Goes the weasel” around 5:10 and you’ll swear it’s The Goof. 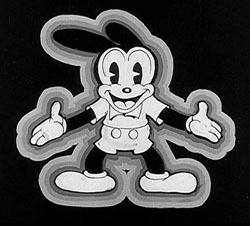 During this 1930 stretch of the Oswald series, Lantz and Dietrich arguably were too dependent on Colvig’s voice and musicality to drive the cartoons forward. At Disney, the strong directing and development of characters served to put a harness on Colvig’s wild flourishes. In effect, it kept his rambling instincts in check. So, the departure of Colvig over to Disney may have been a good thing for both studios. And he surely could thank the exposure he had gotten at Universal for enabling his star-making switch. 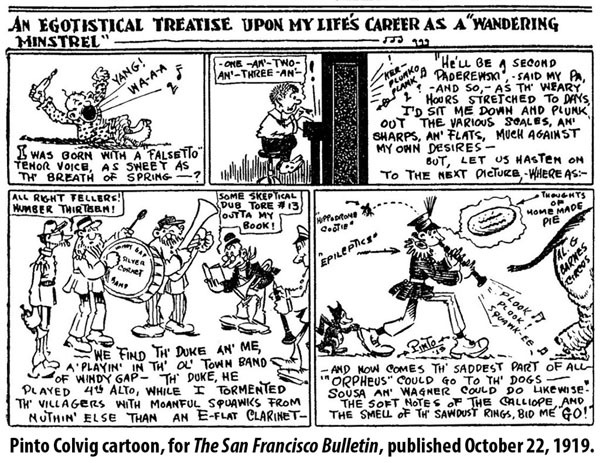 However, the highwater-mark for an Oswald musical oddity belongs to Fowl Ball, another Colvig-fueled cartoon. The centerpiece is his performance of an ethnic novelty song titled “Johnny Schmoker” which had a cumulative verse structure (like “Old MacDonald” or “Twelve Days of Christmas”) and which had first grown popular among nineteenth-century German-Americans. How odd is it to hear Oswald singing this? “Johnny Schmoker, Johhny Schmoker, kannst du spielen, kannst du spielen? Ich kann spiel meine [insert instrument].” The sheer vaudevillian audacity of numbers like this, where the cartoon seems like a cabaret, were generally put to rest once Colvig had gone over at Disney. Yet this period of Colvig-voiced Oswalds remains as a fascinating curiosity where anything seemed to go at Universal. That “Johnny Schmoker” song is a hoot! I laughed out loud. Wikipedia claims that Mickey Rooney(!) voiced Oswald at one point in 1931, but it doesn’t elaborate. 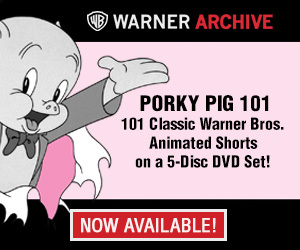 Rooney would have been 11, so I assume this would have been for Oswald in at least one scene as a boy rabbit. Does anyone know anything about it? Yes, it’s Rooney in 1931 (he had a stint as the voice after Colvig had left), but Oswald wasn’t turned into a boy rabbit. All part of the character’s malleability: his voice suddenly changed, no explanation required. That’s what makes it such a great comical cartoon. I enjoy early sound Oswalds the way I enjoy early sound Van Beuren cartoons: they’re as fascinating for the ways they do not work as they are for the ways they do. Always wondered how Pinto got his name. It’s as unique as his place in animation history. Great bits and details about his varied contributions here. Keep the Lantz posts coming! Thanks for your comments, everyone. Also, a favor to ask, for anyone who can decipher the lyrics you hear in the cartoon “Alaska.” I’ve never been able to figure out what Oswald (Colvig) sings right in the opening, just before he sings, “[? ]…we’ll find that gold, by kracky, in Alasky.”If you can discern the words, please post them here, thanks. I hear two names, the first one being either “Benny” or “Vinnie”, the second one “Jackie”. But I have no idea who they would be. “Betty, Jackie…” that’s what I hear too. I didn’t realized that Pinto Colvig was the original voice of Oswald the Lucky Rabbit during the Walter Lantz era! I wonder if those Oswald cartoons will be part of the Walt Disney library? Besides working for Walter Lantz and Walt Disney as the iconic voice of Goofy and Grumpy in Snow White and the Seven Dwarfs,Pinto also worked for Paramount for the Fleischer Bros as Bluto in several Popeye cartoons as Gabby the Town Crier in Gulliver’s Travels and in the Gabby shorts, the grouchy pessimistic Mr.Creeper in Mr Bug goes to Town/Hoppity goes to Town and the original Bozo the Clown. Some Oswalds turned up on Universal’s “Woody Woodpecker” sets a few years back, so I’m guessing they own the actual cartoons if not the character. Very interesting article, Tom, about Oswald, and Pinto Colvig as Oswald…. :) Thanks. I realize it’s unlikely in 2017 but are there any extant films or any extant footage from Pinto Colvig’s San Francisco animation studio? Those were absolutely refreshing, Did not know Second Story Window was an actual novelty tune. I only recal a line of it from a WB cartoon sang by Daffy, if I recall. Until now, I thought that was its origin. Thanks for sharing your knowledge. P.S.- After googling the lyrics, the song is called Go Get The Ax and it was Bugs Bunny from Hare Trigger who sang it, not Daffy, as I was mistaken. I love your columns, Tom. It’s like getting a Christmas present everytime there’s a new one. So glad you enjoy them, Frank. Thanks for looking forward to ’em! He narrates the film throughout, but other actors are sometimes seen as Bozo.